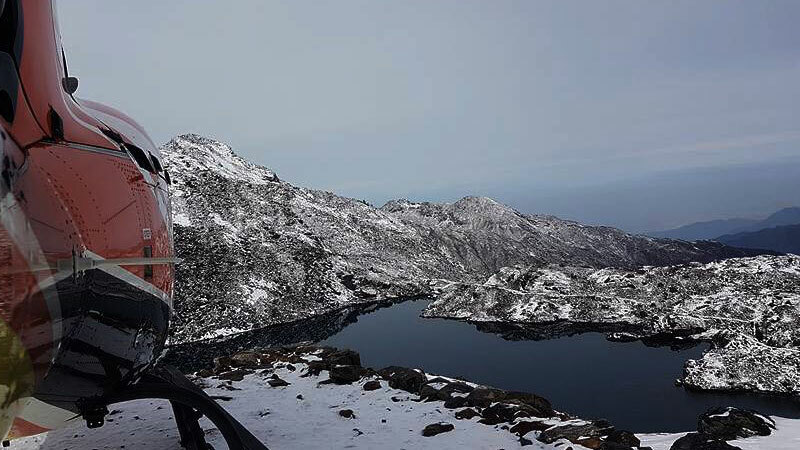 Gosaikunda Helicopter Tour is the private two hours trip from Kathmandu. You will be picked up early in the morning and transfer to the Kathmandu Domestic Airport. Complete the formalities then fly to Gosaikunda. The helicopter will be landed near this holy lake and 20-25 minutes time will be granted to explore the area and check back to heli. Finishing the trip fly back to Kathmandu. Gosaikunda is the holy lake believed to be created by lord god Shiva near Tibetan border to the north of Kathmandu Valley. As per Hindu myth, when the dreadful poison emerged from the ocean, god Shiva swallowed it to save the world. Then he became unstable and began to search the cold water to cool his burning throat. In that situation, he threw his powerful Trisul (holy Trident) in the hills of Gosaikunda and burst a fresh cold water. After drinking, he felt peace and calm. So, the Gosaikunda Lake is considered as a holy lake within Hinduism. Gosaikunda lies under Langtang National Park so there are certain permits require before visiting Gosaikunda. It is also a part of trekking to the stunning Langtang Region where you can see the lofty snow-capped white peaks of Langtang Range Mountains. Day 02: Gosaikunda Tour by Helicopter. Early morning our guide will pick you up from your hotel. Then, transfer to the Kathmandu Domestic Airport where our helicopter will be waiting for us. Complete the formalities and fly from Kathmandu to Gosaikunda. It is about 20-25 minutes flying distance from Kathmandu. Arrival at Gosaikunda, the helicopter will be landed near the lake and 20-25 mins grounded time will be provided to perform pooja or take a holy bath or enjoy the wonderful scenery. Check back to the helipad and fly back to Kathmandu. Arrival then transfers to your hotel and free time. Kathmandu to Gosaikunda by chartered helicopter. Wants some modification on Gosaikunda Helicopter Tour itinerary? contact us to customize it.